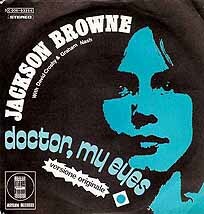 One of Jackson Browne’s signature songs, Doctor, My Eyes has become a modern classic. The song has its mellow flow and those uptempo riffs which herald the chorus, which is infectious and gets you singing along for hours. Doctor, My Eyes is a fun song that people love after thirty years of enduring popularity. Jackson Browne missed becoming one of The Eagles when he turned down Don Henley’s offer to join the fledgling band as it prepared to tour with Linda Ronstadt in 1971. Not to worry for Jackson, however. His solo career ran like quicksilver throughout the seventies and into the eighties, and he remains a popular draw on the concert circuit. In a live performance from the early eighties, Jackson sings his Top Ten hit Doctor, My Eyes while making his piano practically sing it with him. Some people just have the music in them and Jackson Browne is certainly one of them.